When I decided on peanut butter frosting, I figured it would be nice to make fresh peanut butter. It does impart a noticeable fresh taste. I took out the food processor, threw the peanuts in and thought, why don’t I just make the whole frosting in there? Hmm, would it work? Let’s see. It absolutely works, all in one bowl and no need to break out another mixer. It can be used as frosting, filling, or glaze. I’m thinking it would be perfect to frost some doughnuts because it has an amazing sheen. 1. 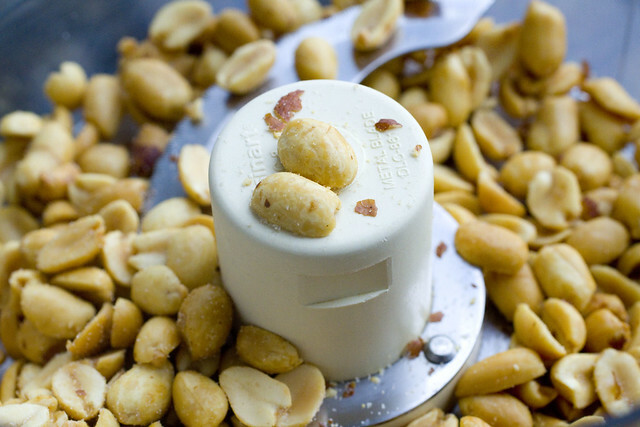 Place peanuts and vanilla extract in the food processor (11-cup or larger) and blend until smooth. 2. Add 1 1/4 cup confectioner’s sugar and process. It will look crumbly. Add half of the milk and process, another 1 1/4 cup confectioner’s sugar, process, then the rest of the milk, process. Add the rest of the confectioner’s sugar. Process. Add heavy cream and process. Should now be smooth. Tip: Do not wait too long in between each addition. 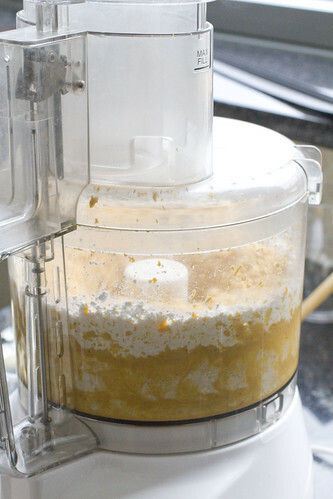 It may stiffen and make it harder on the motor of your food processor. 3. Use as frosting, spread, or glaze or store in an airtight container in the refrigerator until use. Bring back to room temperature before spreading. 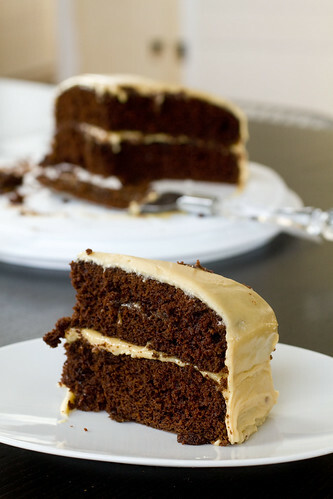 posted by jessica	at 02:38 PM	Filed under Desserts, Recipes. You can follow any responses to this entry through the RSS 2.0 feed. Both comments and pings are currently closed. The cake dough and frosting bits were insanely delicious. Actually…EVERYTHING was delicious! 🙂 Hope you’ll also do a post on the bacon and kimchi sliders! my goodness! that cake looks so good! The cake looks delicious! I can’t wait to try this out for myself. Also, this would be great to surprise friends with something different. my gosh that looks spectacular! love the sheen! Happy Thanksgiving! Thanks Ariana and LimeCake! Happy Thanksgiving!! 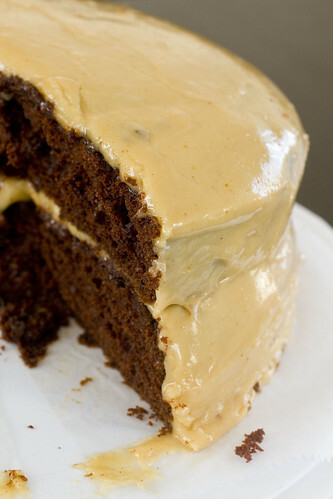 I made a yummy peanut butter frosting (buttercream + peanut butter) with store-bought peanut butter. I’ll make it with the real thing next time! Whatever was I thinking with the Jiffy? 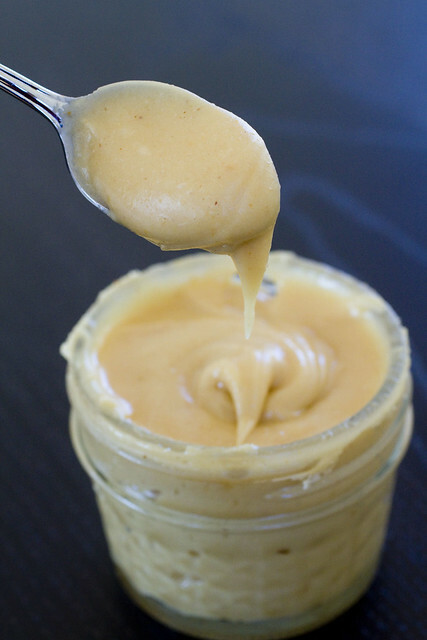 Amelie, for certain recipes commercial PB works great but I love the freshness this one has.